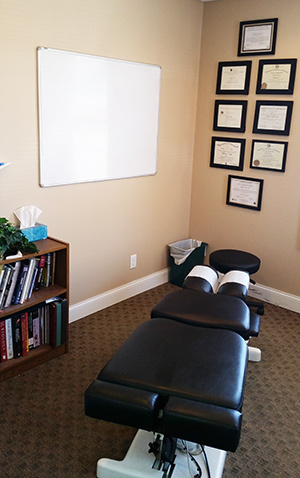 If you’ve never been to our office before, you might be wondering, “What exactly does a chiropractor do?” Dr. Jeff is extensively trained in evaluating your nervous system function, correcting any areas of interference called subluxations. The word “chiropractic” comes from the Greek ‘’Chiropraktikos,” which means “effective treatment by hand.” Dr. Jeff’s health care is based on the idea that dysfunction and disease may begin with the body’s inability to adapt to the environment. By locating areas of the body functioning improperly, where the subluxations are present, we can reduce irritation, restore your body’s alignment and allow you to have greater function. It’s important to us that you’re comfortable and relaxed for your adjustments, knowing that they don’t involve pain and are extremely low-force. Dr. Jeff’s education involved learning several different adjusting techniques and uses them tailored to your needs. We can adjust pregnant women comfortably and children, from newborns on. Keep in mind that chiropractic care is not a cure for anything. Instead, we’ll enhance your nervous system function to allow your body to heal, lessening your symptoms. Dr. Jeff also checks your progress along the way, scanning your level of nervous system function with our advanced technology to ensure that you’re achieving your goals. Food allergies and substances in the environment can severely affect your health. Dr. Jeff utilizes Allergy Sensitivity Elimination Reprogramming Technique (A/SERT) muscle response testing to diagnose allergies. Once we know what your body responds to, we’ll work to eliminate the sensitivity so that you don’t have to rely on medications. All ages can benefit from this therapy. Dr. Jeff is certified by the federal government to provide physical examinations for commercial drivers. Rejuvenate your life, naturally. Contact us today to find out more! On-site X-ray facilities are available to fully understand your needs.